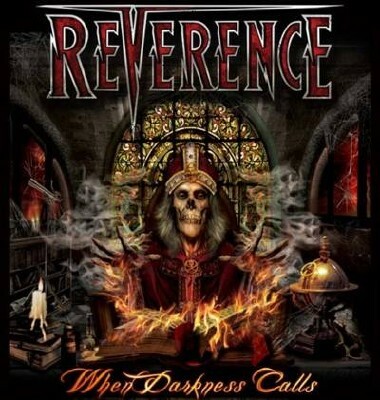 This is a new album by Reverence, a new U.S. metal band, whose members are: Todd Michael Hall (Jack Starr’s Burning Starr, vocals), Bryan Holland (Tokyo Blade, Arrest, guitars), Steve “Dr. Killdrums” Wacholz (Savatage, Crimson Glory, drums), Frank Saparti (Tokyo Blade, Overloaded, Minndcandy, bass) and Pete Rossi (guitars). The style of the Reverence is mid-tempo heavy metal with a strong sound production. The tracks are good and the whole album flows really pleasantly. As my friend Nick noticed the vocals of Hall are similar to the vocals of John Bush (Armored Saint, Anthrax). The guitar work of the album is really good. In conclusion the whole album meets high standards of quality in every aspect. The tracks that I enjoyed the most were “When Darkness Calls”, “Too Late”, “Revolution Rising” and “After the Leaves Have Fallen”. This album is one of the most pleasant surprises for 2012!!! All the fans of classic heavy metal should check this out! !